After my “Is she lonely?” post Geraldo and I spoke more about our girls, this move has been very difficult on everyone. Not only for my girls who left everyone and everything they knew but also for my sisters, who so kindly joined rooms together so my girls could have a room together. My sisters went from playing with one another and “their toys” to now sharing everything from their favorite dolls to mommy and daddy otherwise known as meme and grandpa. So how do we give each girl the attention they need not only as families separated but also with having time alone with mom or dad? In the end they will be best-friends forever. My sisters, my daughters, my life! With researching The Big Latch on event I found that it would be on a Saturday morning, which gave an opportunity of a first “Dadurday”! While taking the youngsters out of the picture with the mommy’s, the dads would be given the opportunity to do something fun with the older girls but the question was what? As mother’s do we woke up and began getting each child ready and by each we’re not speaking of the ones that were only going with us mommy’s but also the older girls. Because face it these daddy’s might not be as color coordinated… Style knowledgeable as we are in some areas ( Sorry Geraldo and dad I know you will read this later.) So after dressing the girls in leggings and cute tops and realizing if one had something different the other wanted to wear the same, from necklaces to boots… (And you will see in an upcoming picture what I am speaking of when I say boots…. Boots that Isabella doesn’t really get to wear out, they were a Halloween costume. OH AND MOMMY DIDN’T KNOW SHE HAD THESE ON!) Well mommy’s and sisters took off leaving grandpa and dad in charge, the thoughts racing through our heads what will they do with two girls? Will Geraldo remember to remind Isabella of the potty breaks because she’ll have too much fun at times to remind herself. But honestly they are the dads they know how to handle these girls, they have bathed them, fed them, put them to sleep and done hair (at some desperate times) for three years now… They will be fine… They will be fine right?…. Grandpa made breakfast for the girls giving them time to play and just talk to dad’s. After which it was almost noon and these girls are like an endless pit, they don’t stop eating, so it was off to their favorite place. 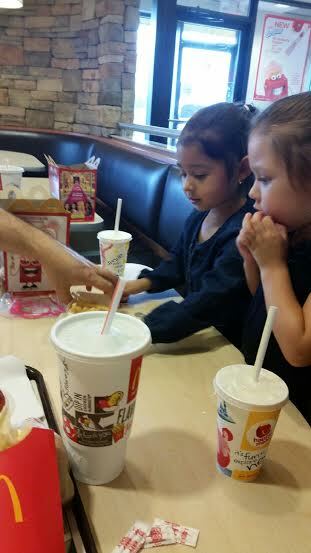 They don’t get Mc Donald’s often, it’s a great treat of chicken nuggets, French fries and Milk not to mention they get a toy. 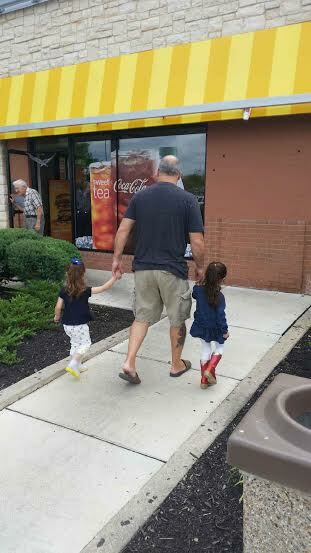 Grandpa walking the girls in to Mc Donald’s. The joy in their eyes are pictures as sent to myself and Heather just shows us how much these girls needed a bit more one on one time with daddy’s. The love they have for one another is beyond words. After a long lunch sitting inside Mc Donald’s where the girls took their time enjoying their dad’s and same goes for the dad’s. 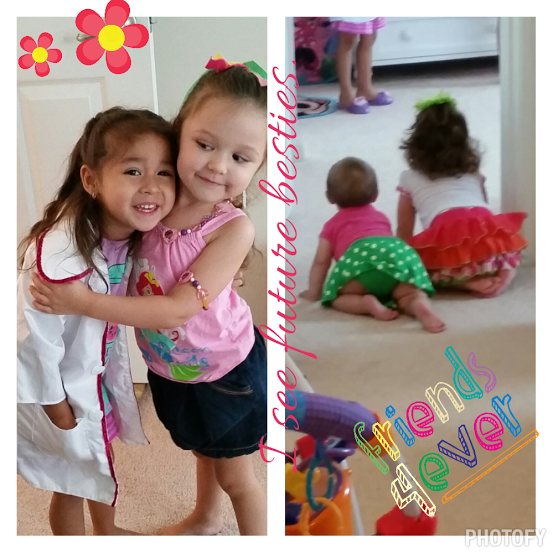 Their little girls not so little anymore, potty trained and speaking back… Ready for their school in the fall, where has the time gone? Something my father knows all too well, as his oldest daughter turning twenty-four tomorrow… Ahhhh! 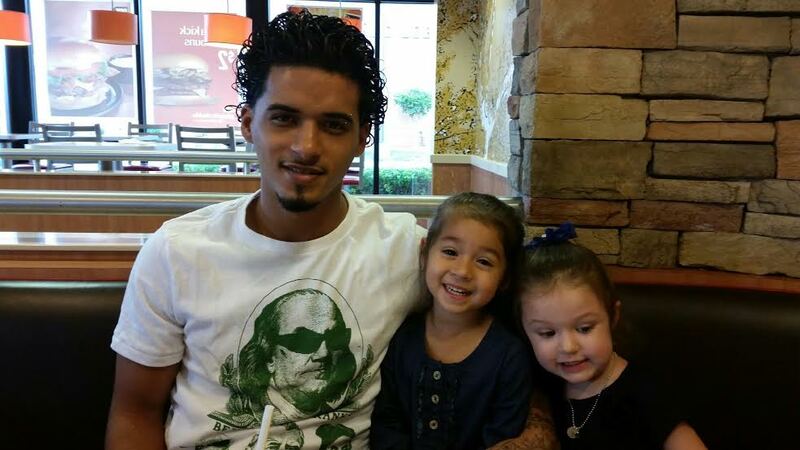 He already knows how precious this time is and is sharing it as a father and grandfather of girls at the same age. It’s a wonderful experience and in our case unusual in some eyes but this is our happy family, these are our joys. The girls excited about their lunches. Next stop Toys-R-Us to look for a piggy bank for Isabella and some toys for the girls; though meme said “no more toys!” the girls all received a doll and Elleanna a toy that sings and moves on the floor for her. After which they met their sisters and mommy’s at the St. Charles Towne Center for some school clothes deals. Reunited as a family of eight their excitement lit up us as they saw their sisters, telling us all about their day and the fun they had with daddy’s. Now the real question is should we do this more often, once a month? Every other weekend? Next event “Momurdays”? Do you have mommy time or daddy time alone with one child? What do you do, I’d love to hear some ideas. Previous Post Is she lonely? Next Post Marvel Universe Live: Whose side will you be on?